Free ground shipping offer valid for standard ground shipping to the 48 contiguous United States. No code required. Additional charges apply for orders shipped to Alaska and Hawaii. Not valid on Prodeal, prior purchases, purchases at retail stores, express shipping or overnight shipping. Free returns within 45 days of purchase. 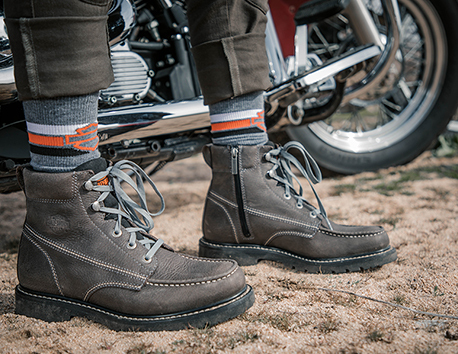 The 2019 Harley-Davidson® Footwear Spring Reboot Giveaway begins at 12:01 am ET on April 16, 2019, and ends at 11:59 pm ET on May 14, 2019. Five (5) Grand Prize winners will be selected in a random drawing to receive a pair of motorcycle boots and a pair of socks. 20% OFF YOUR NEXT FULL-PRICED PURCHASE: Offer valid for 20% off your next full-priced purchase at harley-davidsonfootwear.com when you sign up for email. Click through email to activate. Must redeem within 14 days of receiving the email. Not valid on sale product, Prodeal purchases, prior purchases, gift cards or e-cards, or purchases from retail stores or other websites. Cannot be combined with any other coupon or discount. EXCLUSIVE INFO. You'll also be entered in a monthly shoe giveaway. See Rules. Affiliates. All Rights Reserved. Wolverine World Wide, Inc. is a licensee of Harley-Davidson Motor Company.